Woo hoo! I’ve just finished making my 2015 Mutual Theme Candy Bar Wrappers and I’ve got FIVE, yes five, sizes for you! Update 2/4/2015: The PDF for the Giant wrapper was the incorrect size. The updated PDF is included in the download now. UPDATE 1/17/2015: 1.55-ounce wrapper PDF corrected in the download. It was the wrong size. 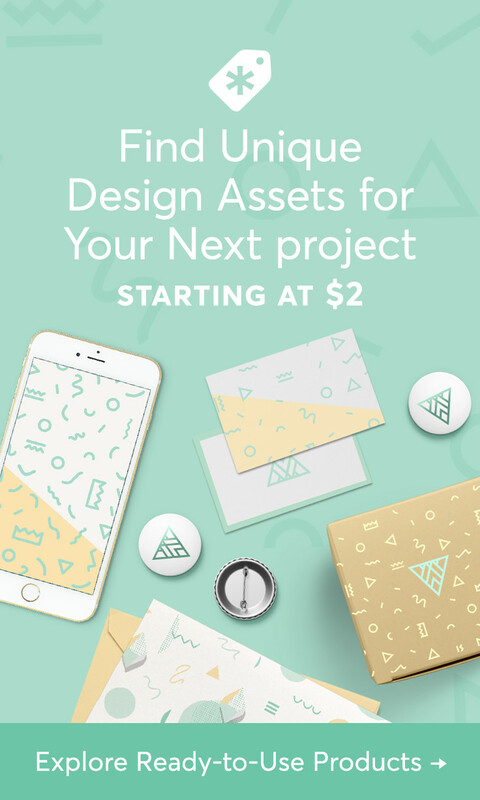 Don’t miss a post or project! Follow this blog via email in the right-hand column! 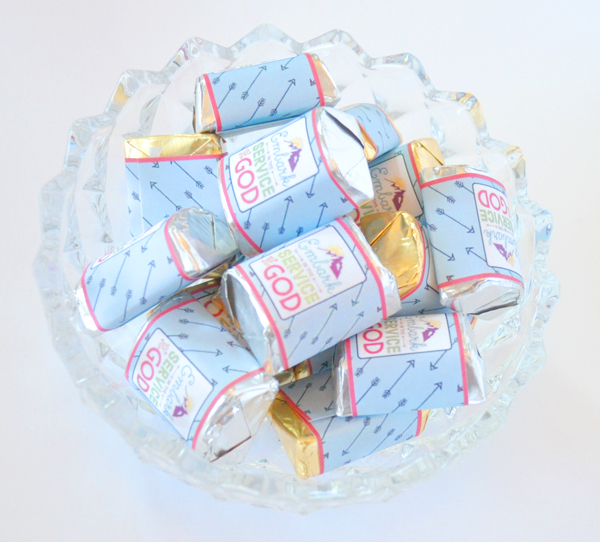 Use these wrappers in lots of fun ways! 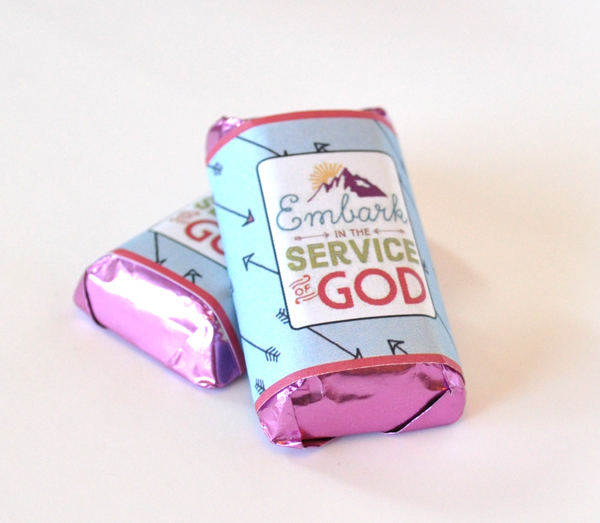 The back of the large wrappers has a unique Personal Progress inspired Nutrition Facts box, “Embark in the Service of God,” and some inspiring scriptures. 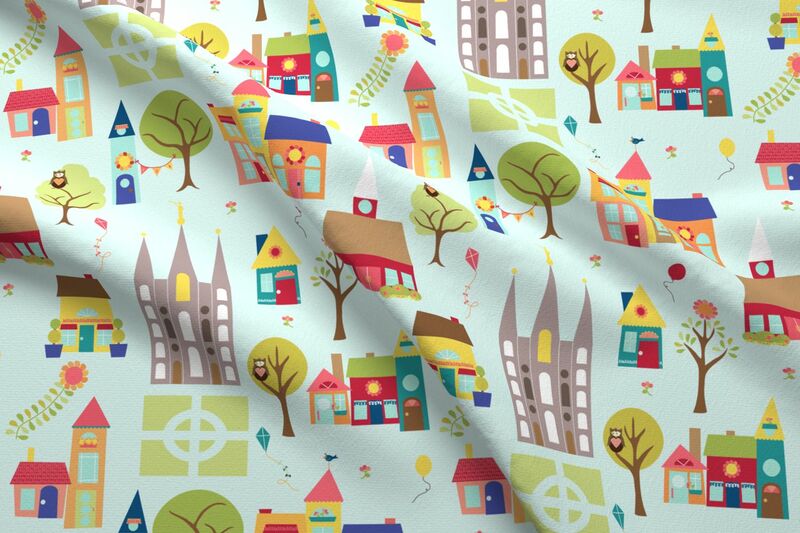 The download includes PDF and JPEG files for all sizes of wrappers. The Hershey’s Miniatures file has 15 wrappers per page and the Hershey’s Nuggets file has 21 wrappers per page. All other sizes have one wrapper per page. Note: For best results, print on your printer’s best-quality setting. 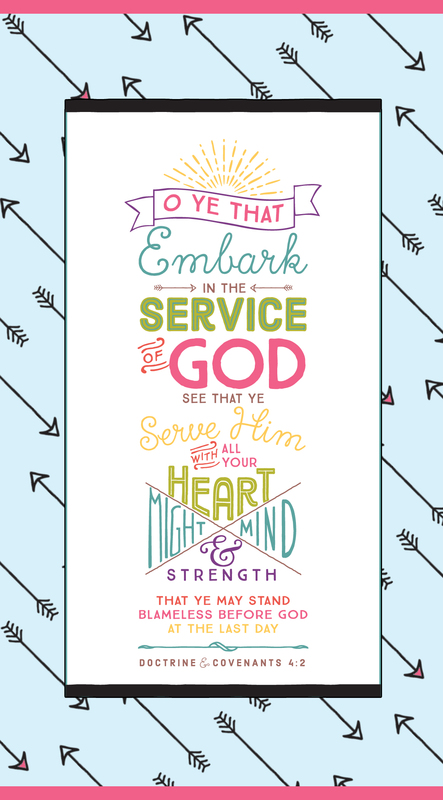 You can download my 2015 Mutual Theme Candy Bar Wrappers here. DO NOT share these files in any way. Send your friends here to download their own copies. Thank you so much for the candy bar wrappers! They are adorable. I have a question about the size of the 1.55 oz wrapper. I printed and cut it out, but it is a bit too big for the candy bar. There is an extra inch in the width so the “Nutrition Facts” section doesn’t line up. Was I supposed to re-size it before I printed it? Thanks in advance for your help! UGH. The wrong file was put in the download. I’ve fixed it and it should work now. Sorry. awesome! I have been waiting for these! thanks so much for sharing all you do! 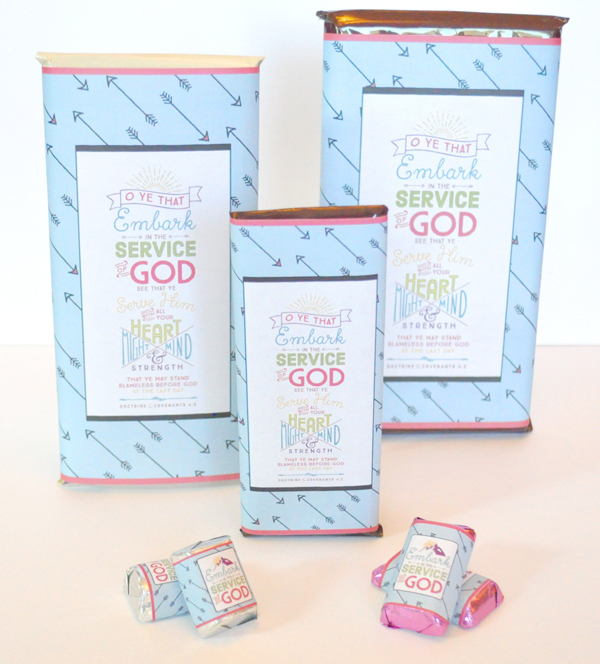 Hi Neisha, Thank you for sharing these – I LOVE the candy bar wrappers that you create each year! I give one to each of my Mia Maids on their birthday’s. I just printed the one for the 6.8 ounce size with the 2015 theme and it is too small and doesn’t fit around a giant candy bar. Is there something that I’m missing? Thank you! So sorry it took so long to answer this. I had a catastrophic hard drive failure and it’s taken a while to get up and running. The PDF file was incorrect for the 6.8-ounce wrapper. It’s fixed in the download now. I can’t wait to use these for stake camp!! I’m the head cook and the yw help with dishes. So this will be fun to give as a reward for helping. Thanks for sharing!! What a great idea! Have a wonderful camp! You are so talented! 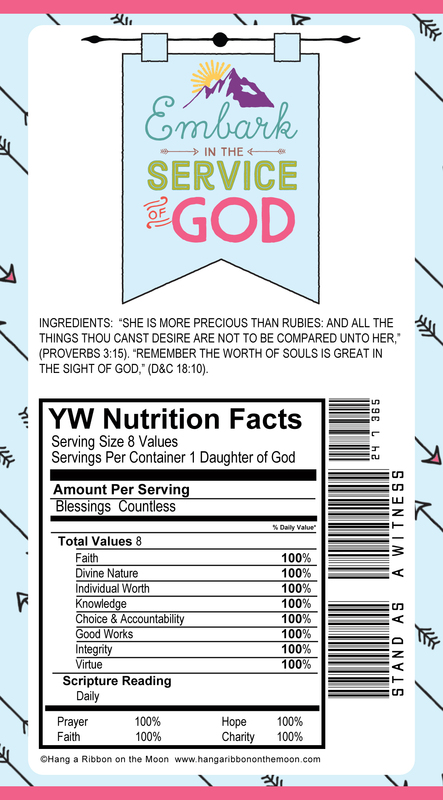 Have you considered making a candy bar wrapper for each young women value? I’ve been looking for something that we could give our young women with their value ribbons. 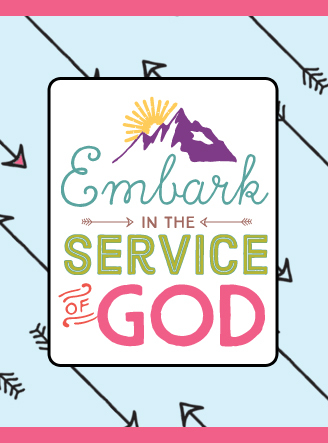 I just discovered your blog today because of your value awards (which are amazing!) Thanks again for sharing all of your wonderful creations for free! Great idea! I will think about it! I recently stumbled upon your website, I absolutely LOVE it! You are so talented and have great ideas! 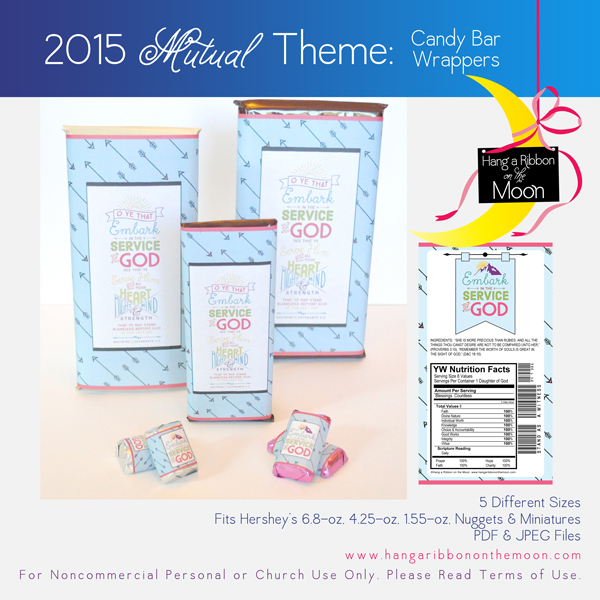 Are you planning on making the candy bar wrappers with the 2016 mutual theme? I was just wondering this myself! I found your awesome website just today looking for candy wrappers for our girls. Thank you so much for sharing your talents with everyone! Are you still planning on doing candy wrappers for the 2016 theme? To be honest, I am not sure yet. I have a lot going on right now, but hope to get to the candy-bar wrappers.